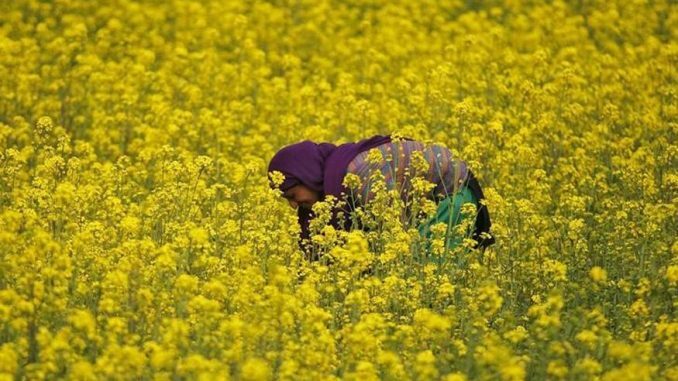 New Delhi : An Indian environment ministry panel recommended to the government that it allow cultivation of a genetically-modified mustard variety, taking it closer to becoming the country’s first GM food crop for commercial production. The federal government will make a final decision in this regard, said Amita Prasad, an additional secretary with the environment ministry and chairman of the Genetic Engineering Appraisal Committee, on Friday. The recommendation follows the government’s rejection in 2010 of a GM Brinjal crop developed by Maharashtra Hybrid Seeds Co. A government panel said last year that the GM oilseed poses no risk to humans. It is highly unlikely to invade natural ecosystems and poses negligible risk to agriculture productivity, the panel had said in a document posted to the Ministry of Environment, Forest and Climate Change’s website. The engineered mustard, developed by the University of Delhi, will raise production of India’s biggest winter-sown oilseed crop and help processors to increase their capacity utilization and reduce dependence on imported oil, said B.V. Mehta, executive director of the Solvent Extractors’ Association of India. Oilseed crushers in the country currently use as much as 35 percent of their capacity, he said. Some farmer associations said they want the government to immediately allow cultivation of genetically-modified mustard to help them boost production. Mustard oil, produced from crops planted in October and November, accounts for about 10 percent of India’s cooking requirement of about 21 million metric tons. Its yellow-colored oil is the third-most used cooking oil in the country behind palm oil and soybean oil. India accounts for about 9 percent to 10 percent of global production, according to G.G. Patel, managing partner of GGN Research. The yield of Indian mustard is only 28 percent of the level in the European Union, 45 percent of Canada and 53 percent of China, he said. India gets more than 70 percent of its vegetable oil requirement from overseas and currently imports soybean oil and canola oil produced from genetically-modified crops, according to the Solvent Extractors’ Association of India. The country is world’s biggest cotton grower and typically more than 90 percent of the crop is genetically modified. India imported 4.2 million tons of soybean oil in the year ended Oct. 31, up 42 percent from a year earlier, according to the association. Canola oil imports increased 6 percent to 377,469 tons during the same period from a year earlier, it said.